Just a quick question as i'm quite new on this forum, but did this ever sell? Posted: Tue Aug 28, 2012 20:13 Post subject: Google Ads keep the POCUK free to join! sorry totally forgot about this.it has been stored in the garage since house move and is still for sale if anybody is interested. Just got a rooftent from craigzxtt. 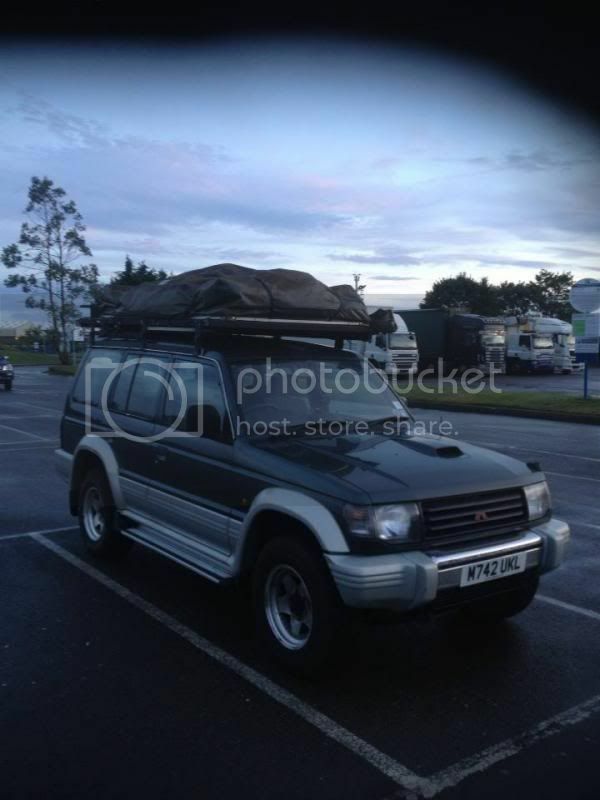 Many thanks for all his help getting it fitted to my Pajero. Drove back with it on, holds up nicely at 60-65 mph and isn't noticeably more noisy! I am about to open it out, give it some air and get it set up properly just to see what it's like properly. Here it is on top of mine when I took a comfort break on the A1 on the way home. 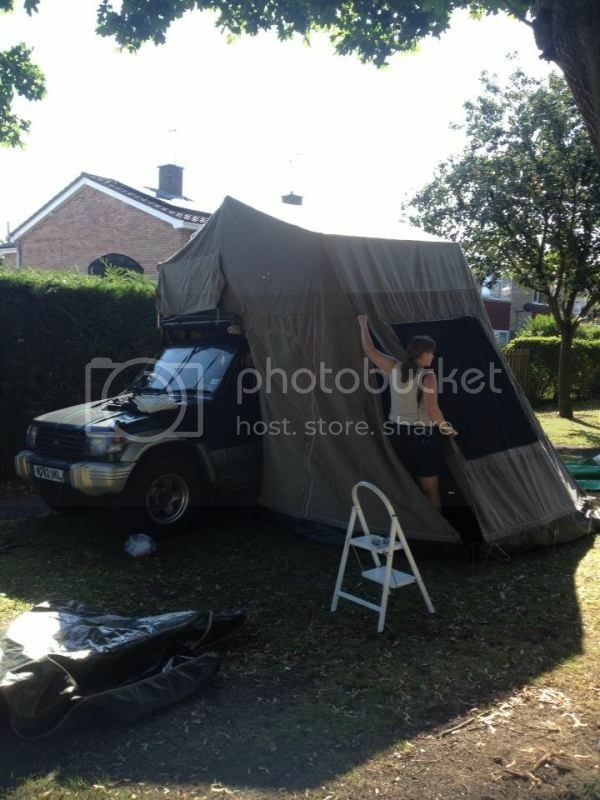 Just the tent up, not yet attached the additional structures. Mpg wise, it did 23.5 mpg on the way to pick it up at a fairly steady 65 mph, not much point going much faster in this in my opinion. And on the way back down purely judging by the fuel gauge it's doing similar-ish mpg albeit at around 60-62 mph. Awesome stuff with Greg ,always liked the idea too .Only thing that stops me is the packing away when I need to go anywhere .When kids are a little older may not be a prob walking everywhere . It took us about 10 minutes to pack it away. Really easy actually. I'm going to use it for race meeting accommodation but it will also probably be holiday stuff too. Quick update. 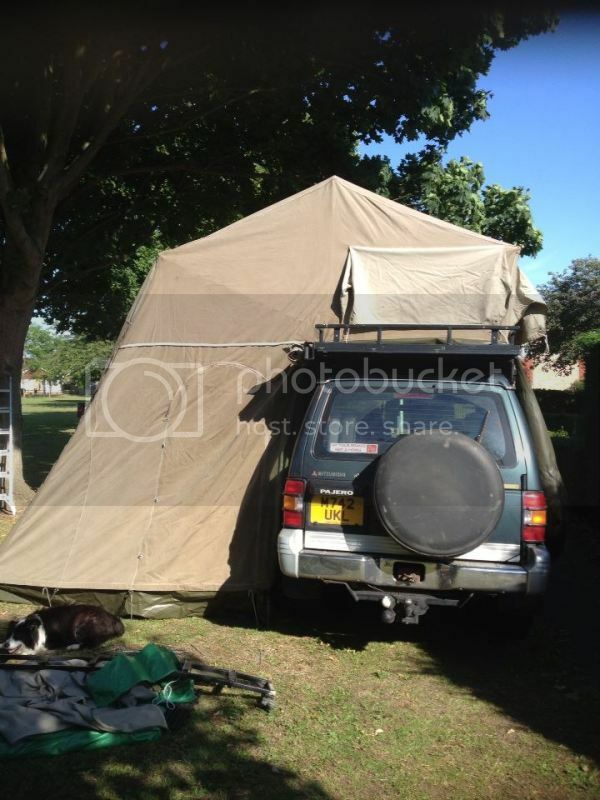 Have now used said roof tent as accommodation at JAE in Wicksteed Park with a bunch of mates from Miss Banzai! The thing got many admiring glances and proved utterly weatherproof despite a fairly serious downpour one night. I am genuinely amazed that I managed to get into bed after a heavy night on the beers/rum but it's a great bit of kit! Mpg wise, if you stick to 60 mph on the motorway, it's about the same as doing 65 mph without it on, about 23 mpg for me. If you try to keep up with your mate's Lancer Evolution IX it's 17 mpg and you don't keep up with him! A question for the owners of this roof tents. How does it work on strong wind? And how much is affected with humidity in the morning. Do you need to wait that it dries or can you put it on the rack not to worry about your sleeping bags? I realize this is an older thread, but any chance that rack and ladder were bought as opposed to made? Just inquiring from the states the make of 'em. Thanks!